Wed., Sept. 12, 2018, 11:15 a.m.
ORLANDO, Fla. – For the first time, Disneyland will break its prohibition on alcohol and begin selling drinks to the general public, the California theme park recently announced. Before, the only place in the park that sold alcohol was the exclusive Club 33, which cost tens of thousands a year to join. But when Star Wars: Galaxy’s Edge opens in 2019, alcohol will be on the menu at its Oga’s Cantina. When the Epcot Center opened in 1982, adult-friendly drinks were sold, unlike at Walt Disney World’s Magic Kingdom. There was “Labatt’s beer in the Canadian section, Beck’s in the German beer garden, Bordeaux and Burgundy wines in the French restaurant,” the Miami Herald reported. Now, Epcot is known for its “Drinking Around the World” challenge and its Food and Wine Festival, which has occasionally become a little rowdy. One incident that went viral brought unwanted attention for soccer star Alex Morgan in 2017. While with a group of friends, she was kicked out of during the Food and Wine Festival. The problems began when Giles Barnes, another Orlando City soccer player, cut in line at Epcot’s U.K. pub, which led to an argument with the other patrons. Barnes swore and was escorted out of the pub and sheriff’s deputies were called. Morgan was observed as yelling and being belligerent. She later issued a statement, denying she was out of control but apologizing. “I used bad judgment, and I was simply trying to support my friends,” she said. Pleasure Island, which opened in 1989, was once so popular, it was blamed for hurting downtown Orlando’s nightlife during the 1990s. Many were surprised that Disney opened the six nightclubs in the first place because it was a departure from the wholesome, family-friendly Disney brand. “I think part of what Pleasure Island’s difficulties were was that it was for adults only. . You couldn’t take your kids there at night because there were people doing shots at the Beach Club,” said Lou Mongello, who writes about Disney and hosts the WDW Radio podcast. Others lamented its closing in 2008. Pleasure Island later was redeveloped to become part of Disney Springs. In its war against Disney, Universal struck with the opening of CityWalk, which featured plenty of restaurants and clubs to grab a drink, such as Hard Rock Cafe and Jimmy Buffett’s Margaritaville. The news was published in a front-page story in Orlando when the Happiest Place on Earth got a little bit happier. Be Our Guest, a “Beauty and the Beast” themed restaurant, began serving beer and wine, making alcohol available in the Magic Kingdom for the first time in its 41-year history. The restaurant opened as part of the Fantasyland expansion. However, there were rules. No booze at lunch – dinner only. And no grabbing alcohol to go, either. Allowing alcohol at a restaurant, styled to look like a French castle that served French cuisine, was a no-brainer, some said. The reaction was mixed with people feeling strongly one way or another, said AJ Wolfe, editor of the Disney Food Blog. The availability of alcohol at Magic Kingdom expanded in 2018, so it’s now sold at every sit-down restaurant. 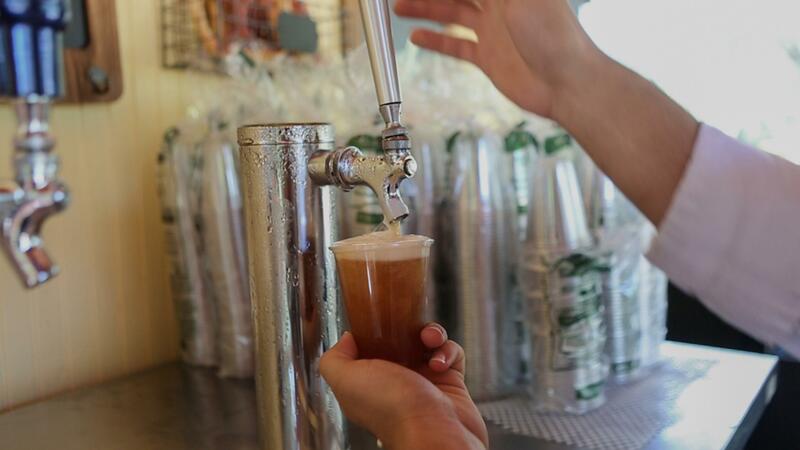 SeaWorld brought back a longtime tradition in the summer of 2018: free beer. It was a nod to the company’s history when SeaWorld was owned by Anheuser-Busch, makers of Budweiser. The free beer ended in 2009 – a move that angered annual passholders especially – and the company was later sold. But it was revived temporarily this summer from May until the last free beer was served Sept. 2. However, passholders 21 and up can still get one free 12-ounce draft daily at Flamecraft Bar or Mama’s Pretzel Kitchen at SeaWorld Orlando. Published: Sept. 12, 2018, 11:15 a.m.